The province of Murcia is in the east coast of Spain and has the Mediterranean’s Costa Calida to its east and the provinces of Andalucia to the south, Castilla-La-Mancha to the west and Valencia to its north. The best way to see all that this province has to offer is to book a Murcia Motorhome Rental, campervan hire or RV rentals online, the provincial capital which is centrally located for the whole province. Murcia has 100 miles of coastline (enjoying 3,000 hours of sunshine) alternating between sandy coves and beaches and rocky outcrops and sheer cliffs, making for an exciting and diverse coastal exploration, made possible by your Murcia campervan hire. 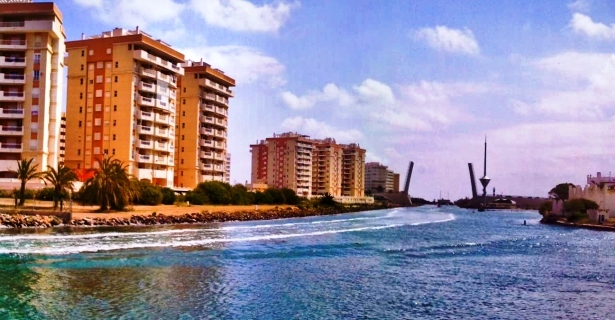 Probably the most popular part of this coast is La Manga Mar Menor. La Manga (The Sleeve) is a narrow strip of land that almost completely separates the Mar Menor Lagoon from the Mediterranean Sea and is an ideal place for family bathing as it has calm waters and gently sloping beaches. If a vacation away from the coast was what you were wanting, you could start by driving your RV rental in Murcia 25 kilometres northwest to the town of Fortuna which has been blessed with, and become famous for hot springs. Although the surrounding area may appear dry, water flows beneath the ground and is sometimes brought to the surface as fountains like La Cueva Negra or the Los Banós. The hot springs, which have been used for therapeutic purposes since the days of the Romans, remain today as an important hydrotherapy centre. Don’t be fooled by Murcia’s apparent lack of rainfall. What little it gets is efficiently funneled into its interior, thanks to its complex irrigation system introduced by Muslim planners. As a result, Murcia grows some of the healthiest lettuce, tomatoes, lemons and oranges (to say nothing of its grapes) this side of the Mediterranean, so you can stop along the way and restock your campervan hire or RV rentals. Travelling north from Fortuna by RV rental in Murcia, you will pass through vineyards before coming to Jumilla. Although Jumilla is overlooked by an old Moorish fort and has other architectural treats, it is perhaps best known for its wine and cheese. No visit here would be complete without trying at least one of each, perhaps the cheese that is soaked in red wine as part of its maturing process. Travelling southwest by motorhome hire in Murcia via the A-7 nestled in the sierras, you will come upon the town of Totana which presents an ideal location for starting hikes or climbs in the mountains. It is also home to over 20 working potteries, many still using the old fashioned techniques. You can continue to enjoy the scenery from your Murcia motorhome rental as you travel southwest to Lorca which uniquely blends its historical heritage with today’s modern lifestyle. It is an important tourist centre and has a hilltop fortress as well as Roman villas but is perhaps best loved for its many fiestas, most notably the somber pageantry of ‘Semana Santa’ or Easter Week celebrations.